Place drained pineapple and cherries in separate bowls. Pour about 1 cup rum over pineapple and remaining rum over cherries. Let stand 1 to 8 hours to marinate. Heat oven to 350°F. Place butter in ungreased 13x9-inch pan; place in oven to melt. When butter is melted, remove pan from oven. Sprinkle brown sugar evenly over butter; set aside. Drain and reserve 1/2 cup rum from pineapple. Arrange pineapple slices in pan in 3 rows of 3 or 4 slices. Drain rum from cherries; discard rum. Place 1 cherry in center of each pineapple slice. In large bowl, place cake mix, piña colada mix, oil, eggs and 1/2 cup reserved rum from pineapple. Beat with electric mixer on medium speed until smooth. Pour evenly over fruit in pan. Bake 40 to 45 minutes or until cake springs back when touched lightly in center. Run knife around edges of cake. Place cookie sheet upside down over pan; turn cookie sheet and pan over. Let stand 5 minutes to allow juices to run down onto cake. Remove pan. Serve cake warm. Serve cake warm with a dollop of fresh whipped cream. 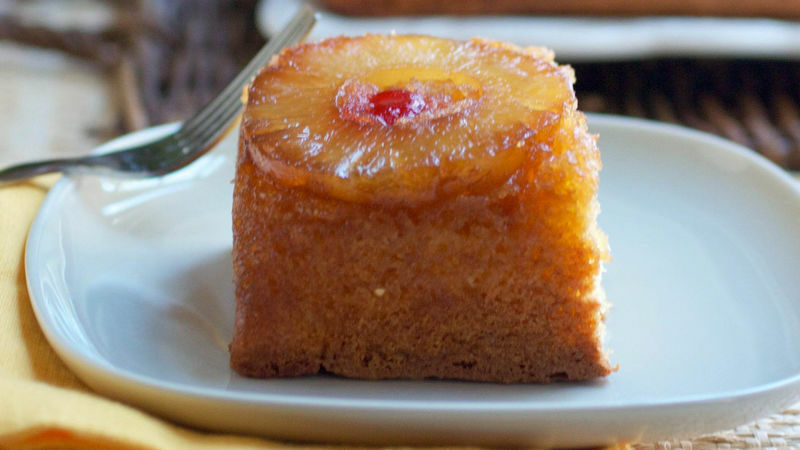 Make the cake alcohol-free by substituting water for the rum.